The perfect all-round tire, matching performance with safety. Perfect grip and handling in every driving situation. 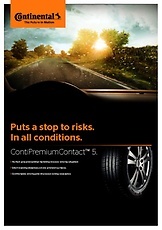 The ContiPremiumContact™ 5 has been developed to react to your driving, creating perfect handling and outstanding grip on the road. Short braking distances on dry and wet surfaces. With its newly-developed technology, the tire is designed to easily grip the road in both wet and dry conditions, resulting in shorter stopping distances to keep you safe. Comfortable driving and improved rolling resistance. The tire's design means noticeably more comfortable driving with perfect handling and reduced rolling resistance to save you fuel. The German magazine Gute Fahrt has published in the actual issue their Summer Tire Test 2017. The tested tire size was 215/55 R 17 W/Y, test vehicle was a VW Passat. Rating for the ContiPremiumContactTM 5 Seal: "Testwinner"
The German magazine Auto Zeitung has published in the actual issue their Summer Tire Test 2017. The tested tire size was 215/55 R 17 W/Y, test vehicle was a VW Touran. Rating for the ContiPremiumContactTM 5: "Highly recommended"
The Automotive Clubs ADAC (D) / OEAMTC (A) / TCS (CH) will publish the Summer Tire Test 2017 on their homepages (www.adac.de / www.oeamtc.at / www.tcs.ch). Rating for the ContiPremiumContactTM 5: "good/highly recommended"
vehicle was a VW Tiguan. Rating for the ContiPremiumContactTM 5: "2nd place"
"Summer Tire Super Test 2016". The tested tire size was 205/55 R16, test vehicle a VW Golf VII. Part 1: dry and wet braking test, selection of the 15 best products, called "Finalists". Part 2: complete test of the finalists only, including mileage and pricing evaluation. to the very different scope of test procedure for "Finalists" and "Non-finalists". Rating for the ContiPremiumContactTM 5: "Finalist / vorBILDlich"
The Swedish magazine Vi Bilägare has published in the current issue (04/2016) their Summer Tire Test in the tire size 205/55 R16 V. Test vehicle was a VW Golf 7. The following technologies are available for this tire but not for each size. Please check here if one of these technolgies is available for your tire size. The SSR system is a runflat technology developed by Continental especially for low section tires, which still keeps the tires compatible with all standard rims. The SSR principle is based on a self-supporting reinforced sidewall. In case of a puncture, this prevents the sidewall from being crushed between the rim and the road, and the tire from slipping off the rim, which makes a spare tire obsolete. Not having to carry a spare tire means a reduction in weight, which improves fuel efficiency. It also adds up to 80 litres of free space in the trunk. Fitting on four positions is highly recommended, if not yet mandatory by law and a tire repair is not allowed. 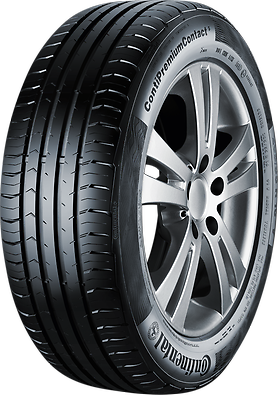 ContiSeal™ is a technology developed by Continental designed to seal a damaged tire tread. In case of penetration by foreign objects such as nails, there is no need for immediate roadside tire changes, and holes remain sealed even if the puncturing object becomes dislodged. ContiSeal™ is a sticky, viscous sealant layer. It is applied to the inside of the tire in the tread area. ContiSeal™ seals 80% of all tire punctures and therefore reduces the risk of flat tires. ContiSeal™ tires are marked clearly with a symbol on the sidewall and are compatible with all commonly available rims. Please note that Load/-Speed Index has been adjusted by one of the recommended results. Because our recommended size can be different from your chosen selection. You can be sure that the recommended tire fits to you.